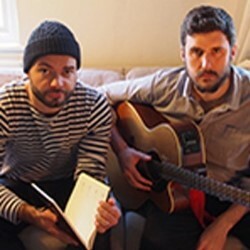 Writer/comedian David Head and singer/songwriter Matt Glover of Sincere Deceivers present a performance of silly love stories and melancholy folk pop. Come and enjoy intertwining tales of lovers, losers and locomotives. Or at the very least come and tolerate some intertwining tales. Enjoyment is entirely optional. Acclaim for David Head: ‘Hilarious… Talent worth watching’ (Kate Copstick). ‘Articulate and clever, with an acid edge' (ThreeWeeks). Acclaim for Matt Glover: ‘Absolutely stunning… hits a nerve… powerful and intense’ (TheMeanderBlog.wordpress.com). Warnings: Contains some strong language.